The Raffles City basement now has so many eateries but very few that we like. A few days ago, we chanced upon this little ramen shop - Bishamon Sapporo Ramen. Ah, another Sapporo ramen joint. I'd heard good stuff about them. And we weren't disappointed. I liked the spicy miso ramen (S$12) I had. Nicely savoury without being overpowering or overly spicy. The char siew slices are very thick but amazingly, they were so tender, they just melted in your mouth. Hubby enjoyed the shoyu ramen (S$12.50). I am not fond of shoyu flavouring and found a perceptible porky taste. But it does grow on you. Just a very different flavour from the miso. This tiny shop doesn't seat very many. Seats spill out into the walkway and most people just eat and go. 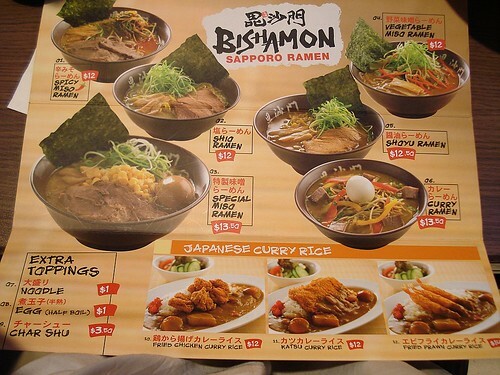 Bishamon also serves curry rice and some appetiser snacks, if you prefer something other than ramen. that will be my dinner tonight! hahaha... I was just wondering what to eat tonight. 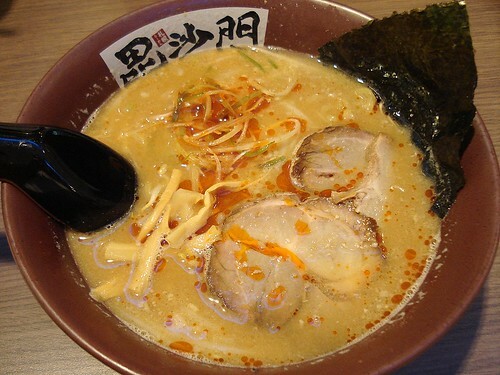 These ramen looks good. I like both miso and shoyu flavored soup. southernoise: haha, ironic, since the ramen visit was partly inspired by your tonkotsu experiment! didally: thanks, they were not too bad. I normally prefer shio though. 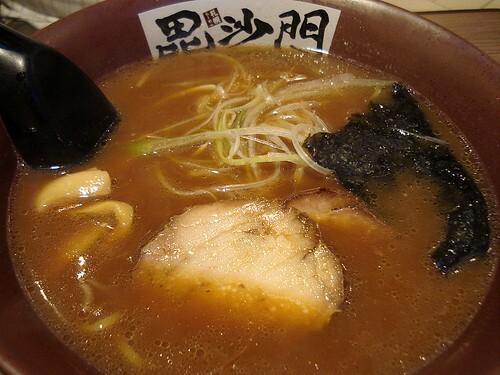 camemberu: Makan'ed the Special Miso Ramen and it was pretty nice. And the waitress keep upselling the side dishes and drinks hahaha... just doing her job i guess! A broken egg with missing yolk??? That's unacceptable! Did you demand a new egg? I had the special miso and she had the shio ramen. In my opinion the special miso was better but shio offered a more subtle flavour. Peeked across at someone having the curry ebi rice which looked... well pathetic. The 3 ebi and the curry at the side somewhat screamed unsatisfying. i did not demand as i was already 1/4 down the bowl till I saw the egg hidden under the seaweed. My latest surf-in is due my latest craze about ramen :) With ramen - whether it be in Australia or in Singapore, I find it astounding that so many (particularly Chinese people) refer to this dish and particularly many of the ingredients in Japanese terms, as well as treat it as a Japanese invention or foreign dish. Not that there is anything at all wrong with this, except that all things came from China and I believe ramen is a direct copy or derivation of a Chinese noodle dish. Shitake, miso, shoyu, sake, are all classic Chinese ingredients after all and are always interchangeable in recipes. Some Asian connoisseurs and gourmands may beg to differ and would insist that Japanese goods were always far superior but this is just a result of wealth and marketing. My new DSLR test shots! T3 serves up pre-fried kway teow! Rednano Wants To Be Your Local Google?